David M. Dell is an attorney in the Financial Services Litigation Group in Dykema's Bloomfield Hills office. Mr. Dell's practice focuses on litigation involving real estate, mortgages and commercial law. He is actively involved with the State Bar of Michigan as a member of the Committee on the Unauthorized Practice of Law. Mr. Dell has successfully litigated matters in state and federal courts. Mr. Dell has argued in front of the Michigan Court of Appeals and obtained favorable decisions from the U.S. Court of Appeals. 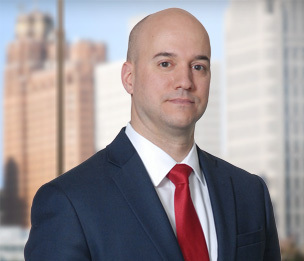 He has represented clients in matters involving claims arising under the Fair Debt Collections Practices Act, Fair Credit Reporting Act, Truth in Lending Act, Real Estate Settlement Procedures Act, mortgage fraud and contested foreclosures. Prior to joining Dykema, Mr. Dell was an associate at a foreclosure firm where he specialized in litigating contested foreclosures and evictions. He has also had past experience in representing clients in matters involving negligence, family law and criminal law.